It's never too late to join Constable Sam Plank as he patrols the mean, and it must be said, often moody streets of Regency London. In this, his fifth adventure, Sam and his assistant Constable, William Wilson, find themselves drawn into the mysterious world of religious meeting houses. Shadowy places where the vulnerable go to find comfort and hope in messages from loved ones who have departed this life. 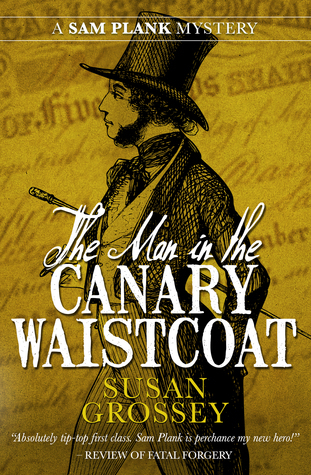 When Sam's wife, Martha, gets drawn into this eerie world, Sam is determined to discover as much as he can about the enigmatic preacher, John Buxton and of the perplexing women, known as ‘heralds’, who receive messages from the dead. 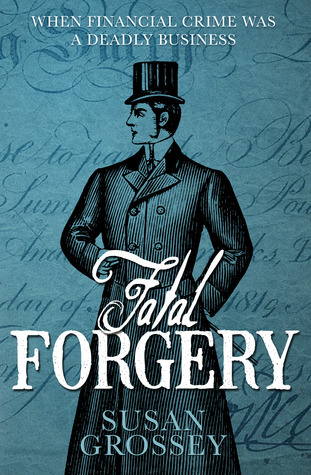 As always, from the very first page, the world of Regency London springs into action and Sam’s patch around Great Marlborough Street takes shape, whether it be serving warrants on behalf of the magistrate John Conant, or attending the scene of a grisly murder, Sam does so with his usual steadfastness and meticulous attention to even the smallest of detail. There’s an inherent dependability about Constable Plank which shines through in every novel and yet, I think that in Faith, Hope and Trickery we see an altogether more vulnerable Sam which is centred on Martha’s unusual susceptibility and of his unerring need to protect her. We rarely go behind the bedroom door of this marriage; there has never been a need before, so it was really interesting to see how this crack in their relationship altered the perceived intimacy between them, something which, perhaps, we have taken for granted in previous novels. The mystery at the heart of the novel, is as ever, beautifully explained and so meticulously detailed that nothing is ever left to chance and everything flows like the wheels of a well oiled machine. And such is the great partnership which exists between Sam and Wilson that it's an absolute joy to see them continue to work so well with each other. 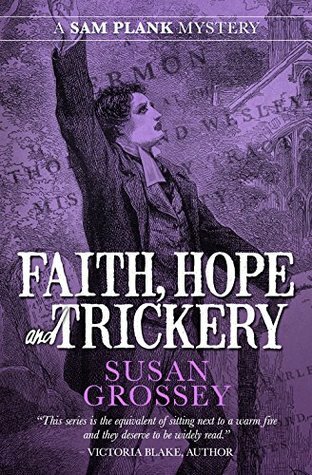 Beautifully written and impeccably researched, Faith, Hope and Trickery takes us into the very heart of teeming London. Whether it be taking a Hackney coach to the religious meeting place at Cooper’s Gardens in Bethnal Green or visiting the criminally insane in the confines of the notorious Bethlem Hospital, I always know that, travelling alongside Constable Plank as he goes about his purposeful business, I am always going to be held in a safe pair of hands. From the minute I opened Faith, Hope and Trickery, cup of tea in hand, I relaxed, safe in the knowledge that neither Sam, nor his creator, will ever let me down. 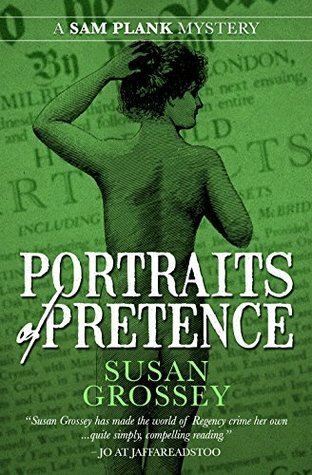 Susan Grossey has written five Sam Plank novels, set in subsequent years in the 1820s: “Fatal Forgery”, “The Man in the Canary Waistcoat”, “Worm in the Blossom”, “Portraits of Pretence” and “Faith, Hope and Trickery”. With the current World Cup being played out in Russia, it seems particularly apt to feature two new poetry pamphlets from Candlestick Press. We also find poems of love, and poems celebrating the beauty of birch-wood and steppe, alongside others that touch on the anguish of being a poet in times of political upheaval. The selection takes us to the heart of human experience with all the passion and drama of the Russian spirit. This mini-anthology offers a fascinating snapshot of a vast and unique literary landscape and will inevitably leave readers wanting more. It is the first co-publication by Candlestick Press in association with Pushkin Press – a new collaboration that will see further titles published this year and next. Boris Dralyuk was born in Odessa but has lived in Los Angeles since he was a child. He has translated Isaac Babel's Red Cavalry and Odessa Stories and also selected and introduced 1917: Stories and Poems from the Russian Revolution, all for Pushkin Press. The only thing I took from school, apart from my excellent education, was a copy of Stolen Apples by the Russian poet Yevgeny Yevtushenko. He once said in one of his verses that, a poet is more than a poet which certainly applies in this collection of Russian verse which have been beautifully translated so that their glorious content capture such a wealth of history and carry a huge sense of the sheer scale of the country and its people. 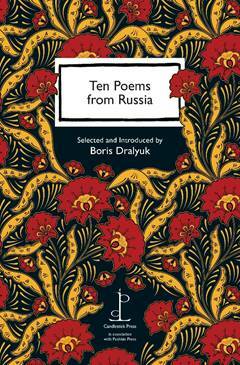 This poetry taster allows us a tantalising glimpse into the distinctive world of Russian poetry with glorious poems by some of the most remarkable Russian poets who have left their distinctive mark on the world of literature. goes to the left, begins a tale.."
Even Jaffa approves of that one! Football has accrued its fair share of sound-bites and foot-in-mouth moments. The poems in this anthology – published in time for the start of the World Cup – strike an altogether more subtle note and take us to the very heart of why a seemingly straightforward team sport arouses such passion and commands such lifelong devotion. Conor O’Callaghan is a poet and novelist. His memoir Red Mist: Roy Keane and the 2002 Irish World Cup Blues was published in 2005. My Thoughts about Eleven Poems about Football.. When I first saw this pamphlet I thought how strange that the ten poem format has been altered and such is my knowledge of football that it took a while for the penny to drop...of course, there are eleven players on a football team. I never expected there to be so much poetry in football but then I suppose its not called the beautiful game for nothing and as the great Bill Shankly once said, "Some people think football is a matter of life and death. I don't like that attitude. I can assure them it is much more serious than that." 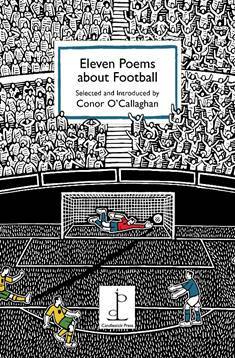 There's a fervour about football poetry which captures the very essence of the game and the stark beauty of watching and waiting and hoping for a win is shared, so lyrically, in this multifaceted collection of verse. as you have always interrupted plans..."
You don't have to be a football fan to appreciate the sentiment expressed in this fascinating collection of football poetry. There's such an expression of emotion; from wins and losses, hopes and failures, and hope soars as dreams explode, and yet, in the words of the poet, Sarah Wardle it's...."only a bloody ball..."
and Eleven Poems about Football. This blasted factory was not what Julia had in mind either. She had always dreamed of attending Oxford University rather than getting her hands dirty and the easy laughter of the other women intimidate her badly. But they are all here together in this munitions factory in a Lancashire mill town, sharing firsts, pitching in and getting on. These Bomb Girls are going to do their best at work, and in love. 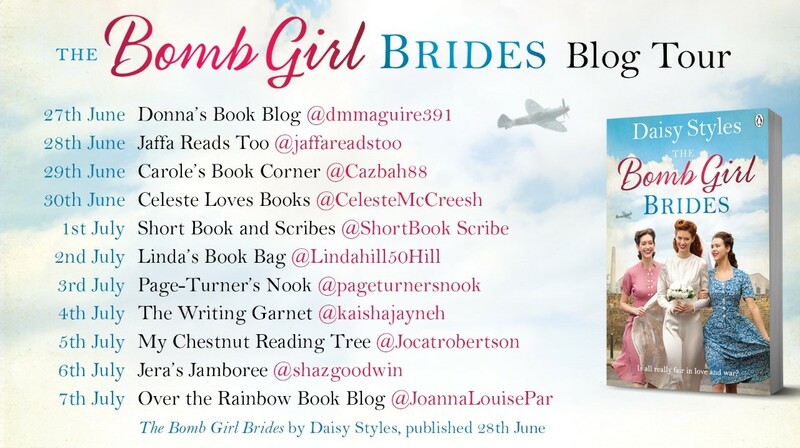 I'm really thrilled that Daisy has written especially for this blog tour stop an original piece that is set in the same timeline as the book! Never before seen Exclusive Content from The Bomb Girls Universe ..
Long strands of Maggie’s gorgeous golden auburn hair lay on the floor at Julia’s feet whilst Maggie, for the moment happily oblivious of the disaster brought about by her best friend, continued smoking her Woodbine whilst flicking through an old magazine. When she’d permed her friend’s hair in London only a few months ago it had turned out beautifully. Gloria’s thick black hair had slipped out of the rollers in great fat gleaming ringlets which she’d pinned into a glamorous Victory roll then arm in arm Julia and Gloria had gone to the Ritz in Piccadilly and danced until the blasted air raid siren had sent the revellers running for the nearest underground station. So what had caused Maggie’s hair to fall out, too much perming lotion or too much heat from the borrowed hair dryer? With only two days to go to Maggie’s wedding day Julia had to think fast – otherwise (to avoid Maggie’s wrath) she’d have to leave the Phoenix, the cowshed – in fact the whole county of Lancashire forever! England, 1813 – Nineteen-year-old Catherine Bennet lives in the shadow of her two eldest sisters, Elizabeth and Jane, who have both made excellent marriages. No one expects Kitty to amount to anything. 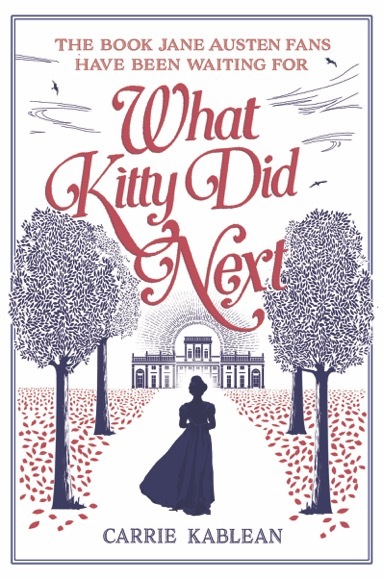 Left at home in rural Hertfordshire with her neurotic and nagging mother, and a father who derides her as ‘silly and ignorant’, Kitty is lonely, diffident and at a loss as to how to improve her situation. When her world unexpectedly expands to London and the Darcy’s magnificent country estate in Derbyshire, she is overjoyed. 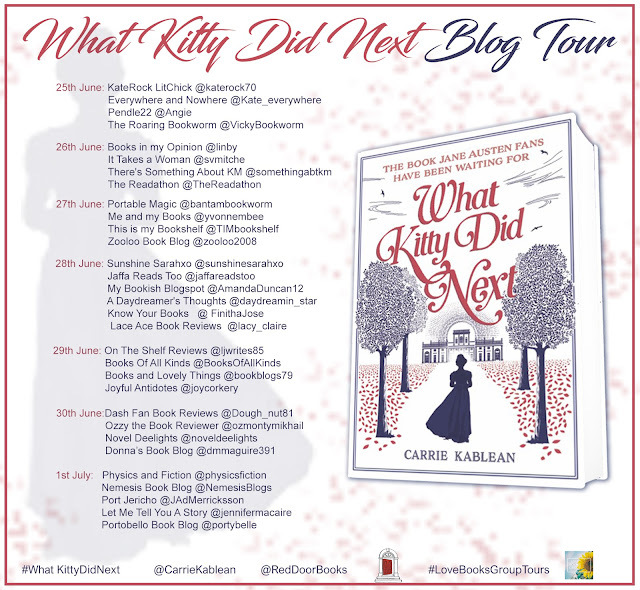 Keen to impress this new society, and to change her family’s prejudice, Kitty does everything she can to improve her mind and manners – and for the first time feels liked and respected. However, one fateful night at Pemberley, a series of events and misunderstandings conspire to ruin Kitty’s reputation. Accused of theft –a crime worse almost worse than murder among the Georgian aristocracy – she is sent back home in disgrace. But Kitty has learnt from her new experiences and what she does next does next will not only surprise herself, but everyone else too. Based on Jane Austen's much-loved characters, this is the story of one young woman’s struggle to overcome the obstacles of her time and place and truly find herself. Here's what I thought about it.. It always fascinates me that such is the appeal of Jane Austen's great novel, Pride and Prejudice that so many authors attempt, in their own way, to continue the story. Some succeed and some don't and I'm pleased to say that What Kitty Did Next worked for me. I've always felt really sorry for Kitty Bennet, so often overshadowed by her more high spirited sisters, she always seemed to be derided as silly Kitty, so it’s been really lovely to see her have her own exciting story where her personality is allowed to shine just as brightly as her feisty older sisters. The author writes well and certainly captures the essence of Pride and Prejudice whilst at the same time allowing a new and fascinating story to unfold. There are the usual quirky moments at home, at Longbourn, as with three of her sisters now married and settled, poor Kitty is left at home with the irascible, Mr. Bennet, and with Mrs Bennet still confounded by her nerves and intent on match making, Kitty is delighted when she receives an invitation to London to stay with the Bingleys and then to Derbyshire and the magnificent Pemberley estate. What then follows is a lovely coming of age story which is really quite charming and which captures the spirit of this iconic novel with good humour and a fine eye for historical detail. I enjoyed watching Kitty grow in confidence and maturity and as the title of the novel suggests, discovering just what Kitty does next makes for a really lovely Austenesque spin-off. Kate Dowd calls Amiens, the sprawling sheep station in New South Wales, home but with her husband away in the war and her father's failing health, life on the station is anything but settled. 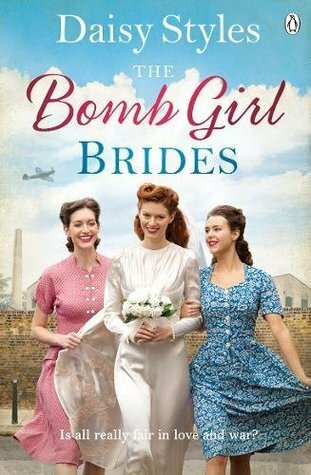 The arrival of two Italian Prisoners of War help to ease the load a little but with the threat of bankruptcy not far away, Kate soon finds that her life is about to change forever. 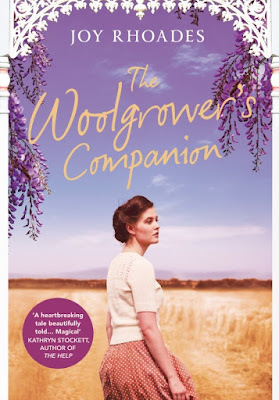 The Woolgrower's Companion is set in 1945 and both the era and the place is captured so beautifully that I was quickly immersed in life at Amiens, which is named because of Kate's father's experience at the Battle of Amiens during the Great War. And whilst the Australian outback is somewhere I am never likely to visit, nevertheless, the author's glorious descriptions of this remote place with its big skies and drought riven watering holes comes to life, so realistically, that I felt as if I was in the kitchen garden alongside Kate, feeding the chooks and watching the colourful lorikeets swoop and fly. In many ways this is a complex and multifaceted story which demonstrates just how complicated life was for women during this time and even though Kate was the only person holding the farm together, the ignorance and prejudices of the men in her world only seemed to make her circumstances more complicated. The story touches on several other injustices especially in the way that Daisy, the aboriginal house maid is treated, however, the author touches on these prejudices with a sensitive and compassionate air but still gets the message across that this was a different time with complicated social morality. The Woolgrower’s Companion is about so much more than social injustice. It's also a wonderfully sensitive love story between two people who are from very different worlds, and yet who find shared companionship in extraordinary circumstances. It's also an inspiring story of survival when the odds are stacked against you and it’s about the strength of this woman, Kate Dowd, who sets out to get the job done when, as a woman, everyone thinks that she wouldn’t be able to function in a man’s world. 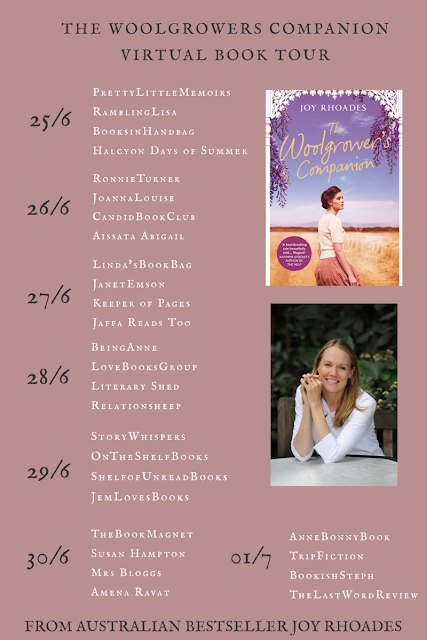 Inspired by the story of the author’s grandmother who lived on the family’s sheep farm in New South Wales, The Woolgrower’s Companion is a beautifully written and stunning debut novel which sits really comfortably within its time frame and which brings this forgotten, but beautiful, place to life in such a wonderful way. 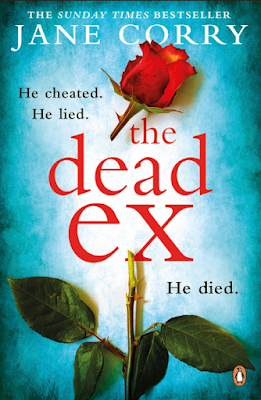 In The Dead Ex three protagonists, Vicki, Scarlet and Helen weave their story over a period of several years. In 2018, Vicki, an aromatherapist, is being targeted by the police about the disappearance of her ex-husband, David. In 2007, Scarlet, is struggling with a dysfunctional mother who is beset by her own specific problems. In 2018, Helen uses her considerable skills to get exactly what she wants from life. These interconnected stories, told in separate strands, and with clever psychological insight, form the basis of an emotional and complex story. With considerable skill, this talented author, has pieced together a story which is entirely absorbing and with a distinct air of menace which is so well controlled that you find yourself holding your breath as the complicated plot get underway. As with all clever psychological suspense stories there is much to take in and lots to concentrate on with characters who are not always very likeable, and yet, I found that my sympathies fluctuated greatly between Vicki, Scarlet and Helen. Some I liked more than others, and one in particular, I actively disliked, but such is the skill of the author that she makes even the unlikable absolutely compelling. The mystery at the heart of the story is well developed, and whilst I can't say too much about that for fear of spoilers, there are definitely more than enough twists and turns to keep you guessing, and several times I thought that I had the measure of the plot, only to have it veer off in a completely unexpected direction. Jane Corry is fast becoming one of my absolute go to authors for well written and emotionally deep psychological drama and for sure, The Dead Ex is up there with the best of this genre. 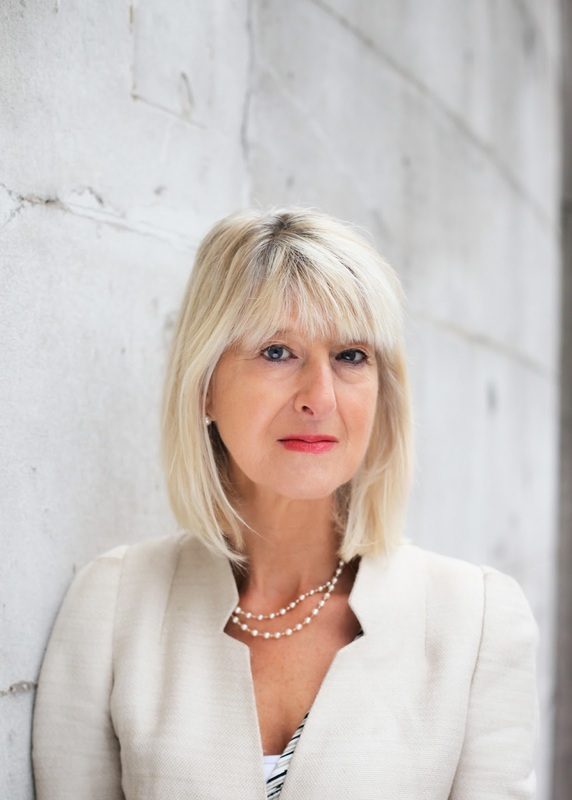 Jane Corry is a former magazine journalist who spent three years working as the writer-in-residence of a high security prison for men. She had never been inside a jail before and this often hair-raising experience helped inspire her Sunday Times bestselling psychological thrillers, Blood Sisters and My Husband's Wife. 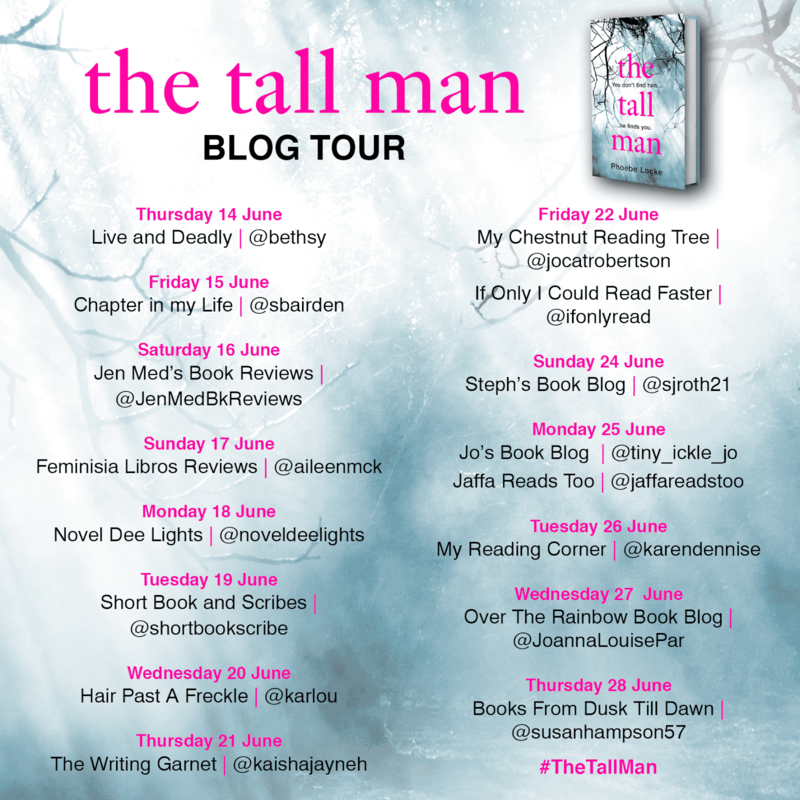 THE TALL MAN is a gripping blend of dark psychological suspense and spine-tingling chills that will have you checking the corners of your room before bed. later she returns, but she can't escape the dark secrets of her past. Two years later a documentary film crew follows Amber Banner on a media tour of Los Angeles. Amber's just been acquitted of a murder charge - but who did she kill, and why? 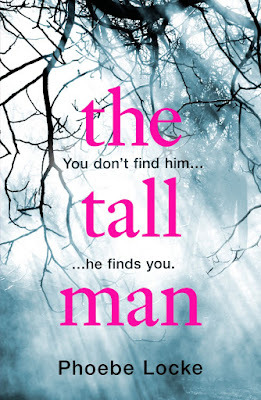 There's something deliciously creepy about The Tall Man and the author does a brilliant job of starting this uneasy feeling from the very start when we are allowed a glimpse into the troubled world of the Banner family. The story begins in 1990 when we are introduced to Sadie who as a young teenager is caught up in the legend of the tall man. That a gathering of teenagers should have such a devastating effect long into the future is what gives the story such a disturbing sense of foreshadowing. And yet, regardless of what happened in the past, in many ways this is a very modern story especially when the narrative moves to 2018 as we follow a documentary team who are filming, Amber Banner, the teenage daughter of Sadie, who has become something of a celebrity in a world where cult status is a dominant force. The legend of the tall man taps into urban mythology, that of a creepy individual who is waiting and watching. I think that every generation has its 'watchers', and that this terror is real and believable comes across so well and even, in the story, when time shifts forwards, and backwards, that sense of unease never really goes away. PHOEBE LOCKE is the pseudonym of full-time writer Nicci Cloke. She previously worked at the Faber Academy, and hosted London literary salon Speakeasy. Nicci has had two literary novels published by Fourth Estate and Cape, and also writes YA for Hot Key Books. She lives and writes in London. THE TALL MAN is Phoebe Locke's debut thriller. Over the last four years of adding WW1 information onto my blog I have found lots of books really interesting so I thought it was time to share them. Some, like this one have been featured before, but its always worth a reminder. 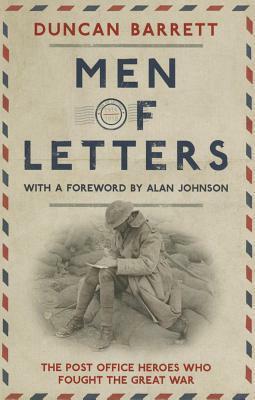 In Men of Letters, the author has with considerable skill, given the men of the Post Office Rifles their own very special voice and in a series of personal stories, poignant letters and diary entries, their life at the front becomes a heart rending chronicle of war. Their social observations forcibly remind us of just what life was like at the front, the interminable boredom of long periods of time closeted in the murk and mud of the French countryside, balanced against the shock of the sniper’s bullet and the agonising terror of waiting for the call to go over the top. It is especially heart breaking to realise that over 1500 of them didn’t make it to the end of the war. In this evocative retelling of the history of the men of the Post Office Rifles, I was forcibly reminded of just how the Great War impacted on the lives of men and women, and of how the ordinary man in the street rose to the challenge of the call to arms. With over 10,000 registered letters per month reaching the Western front, I had never visualised the effort that it took to get the morale boosting mail packets to the men, and yet, whilst the Post Office rifles were made of up from the ranks of postal workers, they were very much part of the fighting force and acted honourably and with great courage under enemy bombardment. 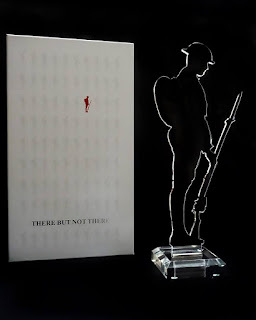 The book is easy to read and well divided into understandable chapters, which cover the involvement of the Post Office Rifles,from the Battle of Festubert during the spring offensive in May 1915, through to their involvement in the Battle of Passchendaele in 1917. The sensitive use of personal documentation highlights the very human face of war and as names begin to crop up in the narrative, I found that I formed an emotional attachment to many of them, and seeing their photographs and reading their memories emphasised to me in a very poignant way, that these are real stories and not just dusty records from the annals of history. We owe a huge debt of gratitude to, not just the men of the Post Office Rifles, but also to the many thousands of young men and women, who gave their lives unquestionably and who with pride and patriotism served their country in a war they really didn’t fully understand. Prince Albert Victor, known as Eddy, is the grandson of Queen Victoria, and the heir presumptive to the British throne. Eddy is a quiet and sensitive soul, often overshadowed by his more rambunctious younger brother, George, and completely at odds with his philandering father, Bertie. Never quite sure of his place in the world but with the weight of future responsibility lying heavily on his young shoulders Eddy finds the strength of purpose he needs in his relationship with the man appointed as his tutor at Eton. The charismatic, Jem Stephens, is everything that Eddy strives, and wants to be, and yet, this close relationship is also filled with a powerful sense of destiny. Moving between locations in London and Norfolk, the world of the nineteenth century aristocrat is brought sharply into focus. As a young man, Eddy moves, almost aimlessly, amongst society, and as he struggles to come to terms with his sexuality, so society eventually starts to dictate how Eddy should behave. 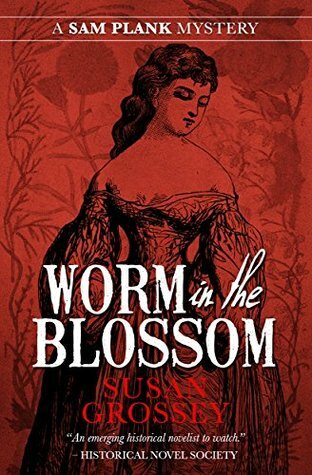 His entrée into the clandestine world of Victorian homosexuality is explored in some detail where it is debatable whether any of the, sometimes sordid, relationships he embarked upon brought him any degree of happiness. 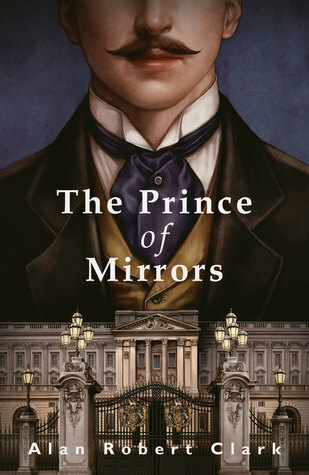 The Prince of Mirrors is an interesting combination of weaving together a fictional tale alongside what is known in history. Of course, there is speculation about Prince Albert Victor, as some of the more lurid gossip of the time tried, and it must be said, failed to pin the Whitechapel murders, more associated with Jack the Ripper, on Prince Eddy. That the Prince moved in the secretive world of homosexual London is also the subject of conjecture, however, his close association with Jem Stephens is certainly based on factual evidence. The author succeeds in bringing into focus the vagaries of Victorian morals whilst at the same time bringing this rather forlorn Prince to life and although there were times when I felt that the story appeared a little disjointed in places, overall this didn’t detract from my enjoyment in reading, and learning more about, Prince Albert Victor, The Prince of Mirrors. Alan Robert Clark was born and educated in Scotland. He briefly attended King's College in London, before starting his career as a copywriter and creative director with a number of leading London advertising agencies. With a background in journalism, Alan has ghost written and co-authored a number of biographies and has one previous novel. Alan now works as a freelance writer. 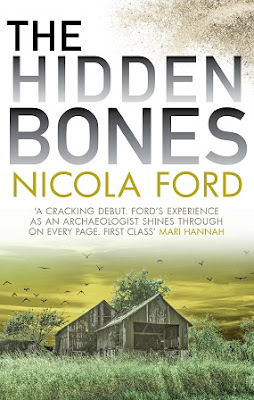 The Hidden Bones is a new series of novels which feature archaeologist, Clare Hills. Putting her expert knowledge of archaeology and ancient archaeological site sites to good use the author has written a fascinating multi-layered story about what happens when the past comes back to haunt those who were once involved in the controversial Hungerbourne Barrows archaeological dig. Even decades later the lure of this ancient site continues to intrigue and when missing archive material is found the past is, once again, opened up to question. The story starts off slowly and then, with careful consideration, each of the layers are stripped away to reveal a dark mystery which, whilst caught up in the here and now, is also hauntingly linked to the long buried secrets of the ancient landscape. However, the shadows of past are not going to lie quietly, and Clare and the rest of the archaeology team soon discover that someone, or something, is hell bent on trying to prevent them from getting any closer to the truth. As with all new series there is a certain amount of getting to know the characters involved and I especially enjoyed the interaction between the lead archaeologist, Dr David Barbrook and Clare, who have a certain amount of personal history between them, and quirky, osteo-archaeologist, Jo Granski, who added a real sense of vibrancy and enthusiasm to the team. As the first book in a series, The Hidden Bones works well and the author’s knowledge of the subject gives the story such an authentic feel that I was soon involved in trying to piece together all the clues. There are some clever twists and turns which I didn’t see coming and the complex nature of the mystery at the heart of the novel is both entertaining and intriguing. There is certainly huge potential for this series and I look forward to seeing where the archaeologists will go in future stories. Nicola Ford is the pen name for rcheologist Dr Nick Snashall, National Trust Archaeologist for the Stonehenge and Avebury World Heritage site. Through her day-job and now her writing, she's spent more time than most people thinking about the dead. Jen's 15-year-old daughter goes missing for four agonizing days. When Lana is found, unharmed, in the middle of the desolate countryside, everyone thinks the worst is over. But Lana refuses to tell anyone what happened, and the police draw a blank. The once-happy, loving family return to London, where things start to fall apart. Lana begins acting strangely- refusing to go to school, and sleeping with the light on. 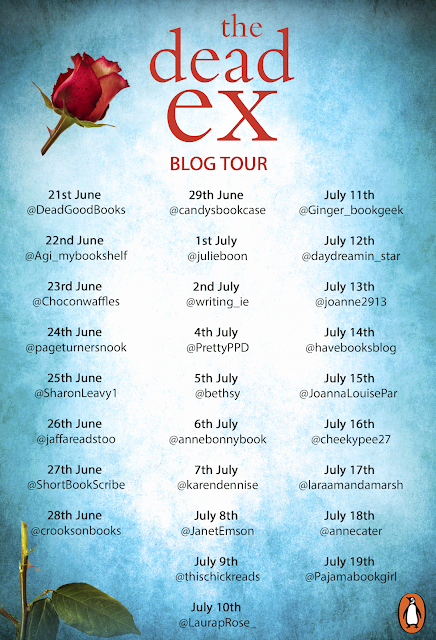 Every parent's worst nightmare is that their child goes missing but for Hugh and Jen Maddox this reality is all too true. As the story opens their fifteen-year old daughter, Lana, has just been found, relatively unharmed, but with nothing to say about where she has been over the frantic four days of her disappearance. What then follows is a rather bleak story of a fractured family who struggle to come to terms with, not just, Lana's refusal to recall anything about her disappearance, but also, about her subsequent disruptive behaviour once she gets home. The way that this troublesome conduct affects the family is crucial to the way the story progresses and, whilst, it’s not always very easy to like Lana very much, there is no doubt that her unstable personality is what gives the book its drive and energy and certainly keeps the momentum of the story strong and meaningful. Lana’s volatile relationship with both parents, and particularly with her mother, is tested to the limits of everyone’s endurance, and it is to Hugh and Jen’s credit that they do their best to support this wild child who seems to push them away at every opportunity. Whistle in the Dark is a perceptive dissection of a troubled family who seem to be constantly at odds with each other. The mystery of what happened to Lana during the four missing days is eventually revealed however what’s is more interesting is how the author gets us to that point and her fine dissection of family life is perhaps where the story sits most strongly. 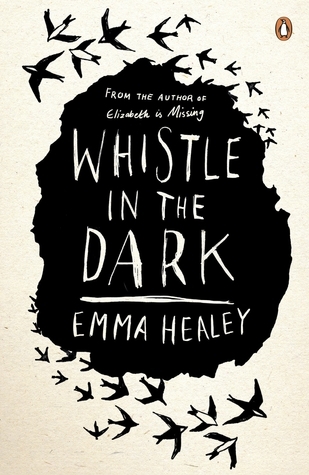 The author writes this introspective novel very well and in Whistle in the Dark she so cleverly exposes the absolute anguish of mental health issues which can so easily fragment and eventually destroy family life. 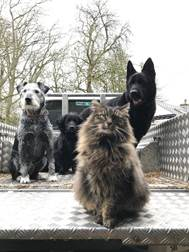 Bodacious: The Shepherd Cat is the heart-warming and charming tale of Bodacious – the most famous farmyard animal since Babe – who tells us about life as the Shepherd Cat of Black Sheep Farm. It’s a beautifully written memoir which captures perfectly the highs and lows of idyllic country living, and all that it entails – early mornings, frosty starts, beautiful sunrises, adventurous rare-breed Zwartbles sheep, hard work, entertaining animals, mouth-watering food and the kind people you meet along the way. 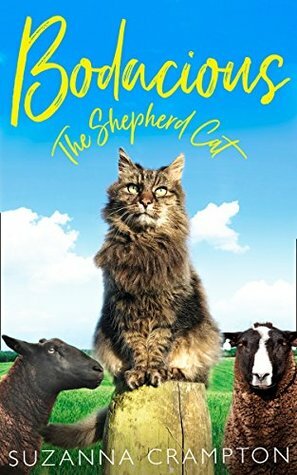 Written from the perspective of this extraordinary cat, his charming memoir takes us through a year of life on the farm; from Bodacious’ daily farm duties and shepherding adventures, to his unbreakable bond with the shepherd, Suzanna. 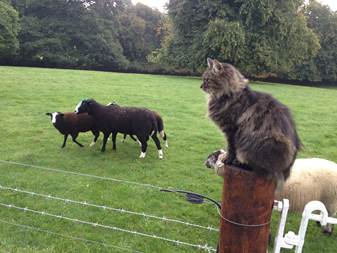 On Black Sheep Farm in County Kilkenny, with gentle fields that slope towards the River Nore, Bodacious the Shepherd Cat can be seen amongst the rare-breed black Zwartbles sheep which give the farm, not just its name but which also produce the rather special yarn from which the shepherd produces beautifully soft blankets. Bodacious first came to Black Sheep Farm as an abandoned cat and quickly became accustomed to farm life, tending sheep, caring for the lady egg givers and generally making his presence felt amongst the other animals who call the farm home, and as the farm closed itself around Bodacious, so Bodacious lovingly wrapped himself around Black Sheep Farm becoming as one with its rhythms and routines. This lovely look at a year in the adventurous life of Bodacious takes us through the seasons. From spring through to winter there is never a dull moment in the life of this intrepid farm cat, be it tending his flock, supervising lambing or patrolling against the ever present threat of foxes, what is always guaranteed is that he does so with lively wit and considerable charm. The very essence of Bodacious is captured so beautifully that it becomes a real pleasure to turn the pages of this lovely book to see just what's going to happen next as he goes about his important farm business. His voice is strong and purposeful as he chivies and scolds and generally makes sure that everything is as good as it can possibly be. However, the book isn't just about Bodacious, although his magnificence shines through on every well written page, it's also a love story to Black Sheep Farm and to the shepherd, Suzanna, who cares so deeply for the land, its soil and its ancient footprint on the landscape. Suzanna Crampton grew up in the USA but spent her summers at her grandparents’ small farm in Kilkenny, Ireland. 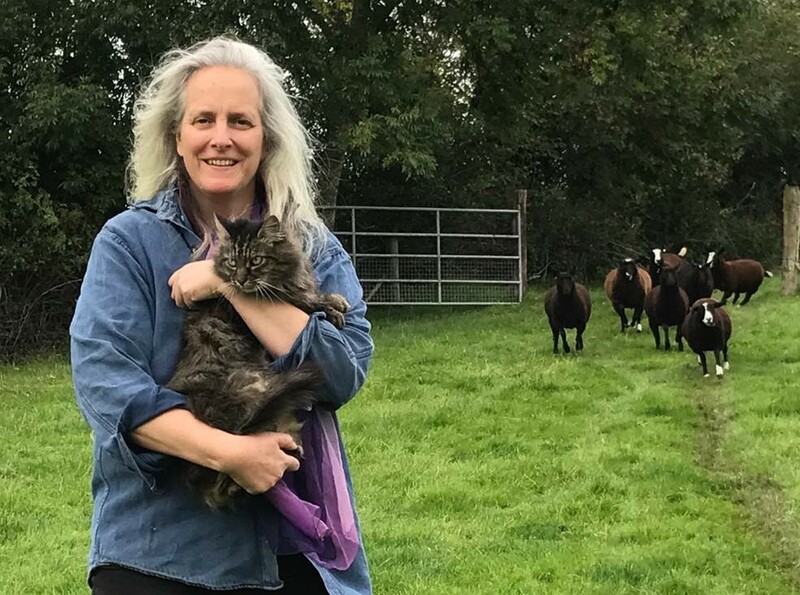 She studied agricultural and environmental sciences at Sterling Institute in Vermont and returned to Kilkenny in 1997. She now lives on her family farm with her flock of Zwartbles sheep, alpacas, horses, chickens, dogs, and Bodacious, who strolled into her life 11 years ago. Lana Green has a talent for pushing people away. As a writer, she’s perfectly happy to be left alone with her books. But when she meets Jack Buchanan and Nancy Ellis Hall, Lana’s solitary life will change for ever. Nancy has dementia, and social services believe this makes her vulnerable. But Lana can see the funny, brilliant woman underneath the illness. As Lana and Jack struggle to keep Nancy out of a care home, Lana starts to question everything she ever thought mattered. Because what’s the point in stories, if there is no one to share them with? 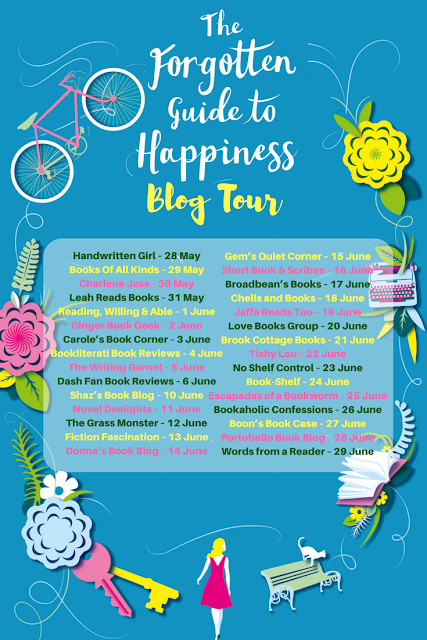 Lana is a struggling young writer who, after the success of her debut novel, is determined to get to grips with her difficult second novel. However, her home circumstances are conspiring against her and, as she takes stock of her life, so she gets drawn into the world of Jack Buchanan and his step mother, the renowned writer, Nancy Ellis Hall. Nancy's dementia is starting to become a problem but this strong-minded woman is determined to have control of her own life even though she really does need a little help. When Lana needs somewhere to live, in order to keep Nancy’s safe, the perfect solution is for Lana to move in with Nancy as her live-in helper. The quirky mixture of these two very different characters infuses such warmth and wit into the story that it’s a real pleasure to read of their exploits as they gradually get used to each other’s company. This is a really lovely story about friendship and companionship which looks at the need we all have to be loved and understood. The characters are quite special, especially Jack, who takes on the role of Lana’s muse as she searches for the perfect hero for her novel. I loved the way that the author has included references to other writers within the story which adds a nice quirky touch and makes Lana’s journey as a writer all the more realistic. Nancy is such a strong character and so determined is she to have her voice heard that she, quite literally, leaps of the page. I found her story quite poignant, especially the way in which the dementia has taken hold of her, which is so sad, but also tremendously inspiring too, I admired Nancy's strength of spirit. 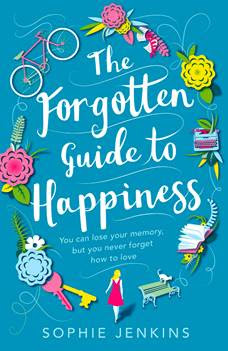 The Forgotten Guide to Happiness is beautifully written story which covers the progression of dementia in a really sensitive and positive way and which also shows that life, when we least expect it, can suddenly take a surprising turn for the better. Despite Colette's wariness, romantic Belle-Île still fascinates her. She takes on the running of her mother's flower shop and makes friends with Élodie, from the Old Lighthouse where Thea once worked as a nanny, and with the enigmatic Étienne who shares Colette's mixed feelings about the island. As Thea opens up to her for the first time, Colette finds herself softening and being drawn back into the landscape of her past. But can Belle-Île also be a part of her future? Colette returns to her childhood home on Belle-Île-en-Mer in Southern Brittany, ostensibly, to look after her mother, Thea, who is terminally ill. This long postponed return brings back many memories for both Colette and her mother, as each of them have good reason to be wary of each other. Taking over the organisation of her mother's flower shop was never on Colette's agenda but as her mother starts to deteriorate so the languorous nature of the island begins to work its magic. 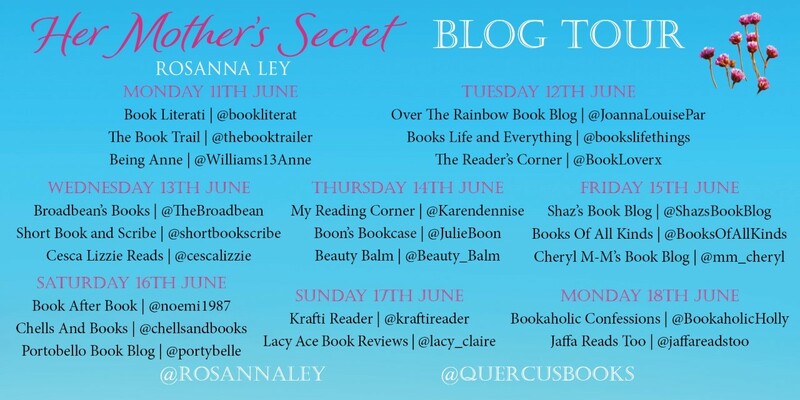 Colette gets drawn deeper and deeper into a long buried secret which surrounds her mother's time on the island. The author writes this multi-layered family drama really well and infuses such personality into her characters that you immediately start to care about what happens to them. I loved the gradual way the story unfolded so that when the secret is finally revealed, the characters have become so special that you really want everything to work out well for them all. I particularly looked forward to the different chapters as each was narrated by a different character who each have a very special role to play in the story. 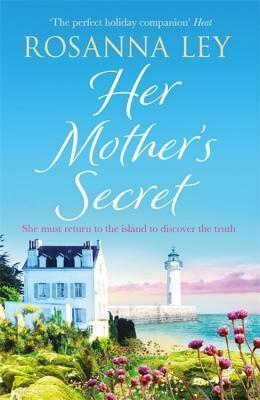 Her Mother's Secret is such a strong character driven novel which really brings the story alive in the imagination and yet, it's not just about devastating family secrets, it's also a stunning tribute to Belle-Île-en-Mer and the people who call the place home. This is such a lovely summer read that I was quite enchanted by the story which is beautifully written by an author who really knows how to hold the reader in the palm of her hand. Rosanna Ley works as a creative tutor and has written many articles and stories for national magazines. 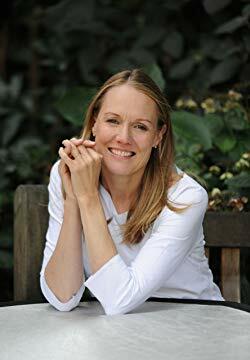 Her writing holidays and retreats take place in stunning locations in Spain and Italy. When she is not travelling, Rosanna lives in West Dorset by the sea. 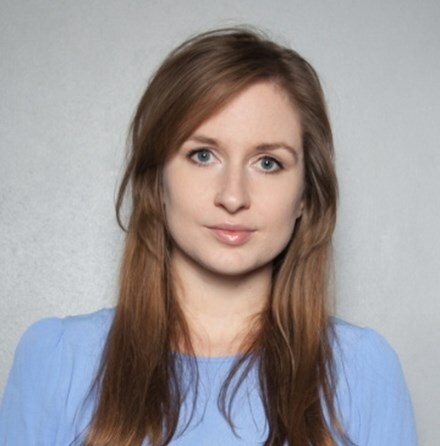 Rosanna is available to write features and for interview opportunities. 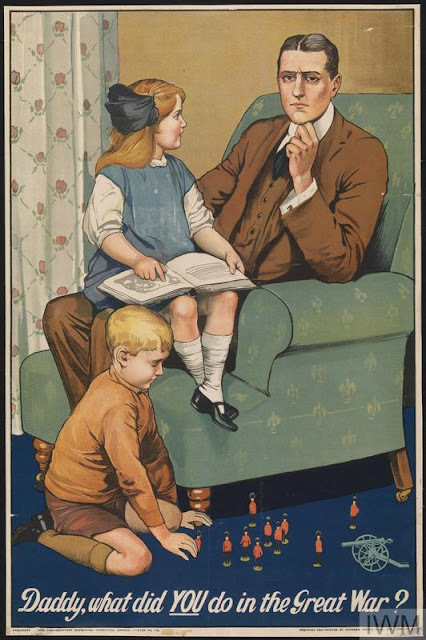 Of the 7.5 million men who volunteered to fight or were conscripted to fight in WW1, over 500,000 children lost their fathers, which was the largest loss of fathers in modern British history. 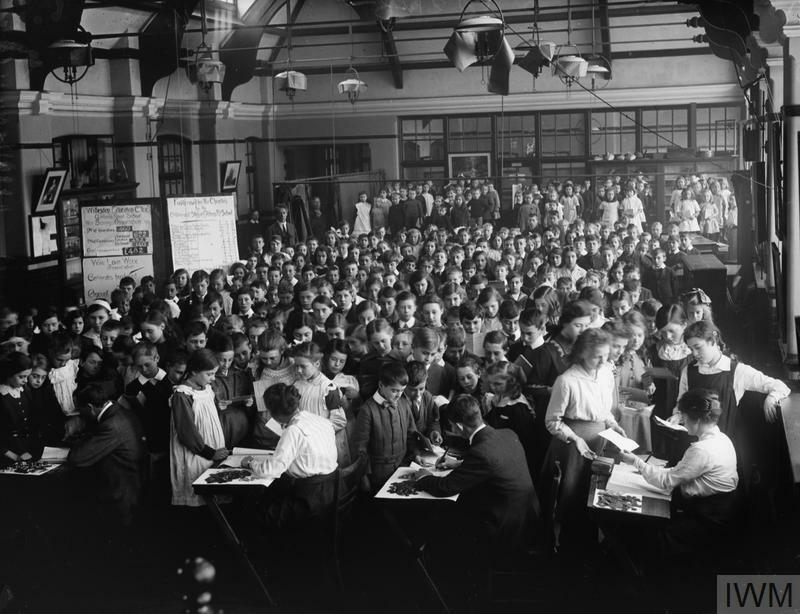 At school the children were taught about what was happening in Europe and they were encouraged to help at home, especially if their mother's were involved in war work. Children would also organise egg collections, fundraising activities and wealthier children would invest in war loans to contribute their help to the war. And love, that’s born of pity, to the earth. And laughter comes back to the earth again.